Happy Thanksgiving week and thank you for your support of and interest in St. John’s recovery! The St. John Community Foundation is honored to be part of the massive and united effort underway to help St. Johnians put their lives back together. We helped facilitate the first Long Term Hurricane Recovery Work Group Meeting on November 9th which was well attended and now have team development in the works. I have attached a visual summary of that meeting with proposed task forces needed to rebuild our island based on proven disaster response models successfully used around the globe. Our goal was to offer everyone a clear picture of each organization’s current operations and discuss goals for recovery in anticipation of identification and fulfillment of unmet needs while avoiding duplication and streamlining a unified effort. 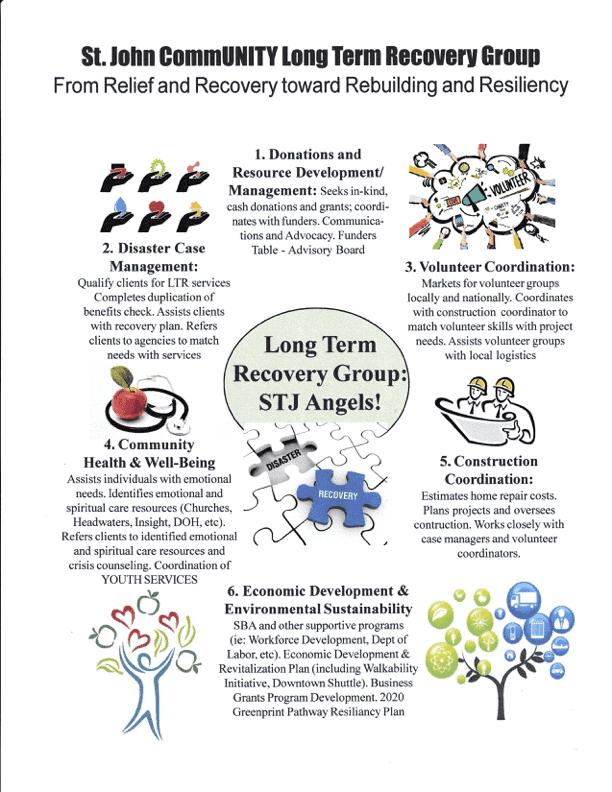 The direction and activities of this group must be CommUNITY driven by many St. John Angels, so we have transitioned our St. John Angel Network into this Long Term Recovery work. We are featuring and promoting ALL organizations serving St. John because the entire community will benefit by helping each and every organization achieve their mission of rebuilding St. John and improving the quality of life for all our residents! To kick start the support for this work, we are collaborating with all St. John Angels including non-profits, community and business leaders, public, private and governmental agencies, and are driving a Giving Tuesday campaign to benefit the St. John Angels in Long Term Hurricane Recovery efforts. This is just one more way to get support to the many organizations on the ground in a fiscally responsible, conscientious and direct manner. is the Tuesday after Thanksgiving (November 28th this year) and the first key date in the holiday season of giving to solicit end-of-year donations. In preparation, we have recently created a new website and social accounts to highlight all stjAngels in the network with more being added daily. 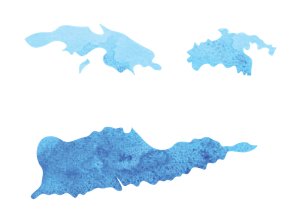 We’re leveraging these platforms to tell the story of our resilient island community and the significant empowering potential the Angel Network has on its long-term recovery. We will be highlighting various stjAngels in the network, some of which we’ve already added to the website’s Angel Spotlight. This Thanksgiving week, we have so much to be thankful for. If you are on island, please join us for a CommUNITY Thanksgiving (Thurs Nov, 23rd in Frank Powell Park in Cruz Bay at 4pm) for everyone who has been a good neighbor, helped a friend in need, volunteered to help others across island, and given in so many ways. Help us extend thanks beyond our own circle of family and friends to embrace the greater St. John Community, including the responders and linemen (and women) who have given up Thanksgiving at their homes with their family and friends to be here with us in our disaster recovery. We truly do have so much to be thankful for. Special thanks to the CommUNITY Thanksgiving partners: St. John Rotary, Starfish Market, Cruz Bay Landing and everyone who will be bringing their family favorite side and/or has volunteered to cook/slice a turkey (let us know if we can arrange to get you a turkey to cook/slice for us) – We look forward to music by the Pan Dragons, Kristen’s choir and more!!! I would like to make a donation for hurricane relief as a Christmas gift to friends that own property on St. John. What is the best way to give a monetary donation for St. John’s recovery efforts? Here is a link to make a donation and also understand where the money goes. http://thestjohnfoundation.org/donate Thank you for your big heart and for making this generous gift!! !